Both a physical space and a grant program, FOYER allows graduate students across all four Faculties to discover research affinities that link the arts, sciences, and social sciences. 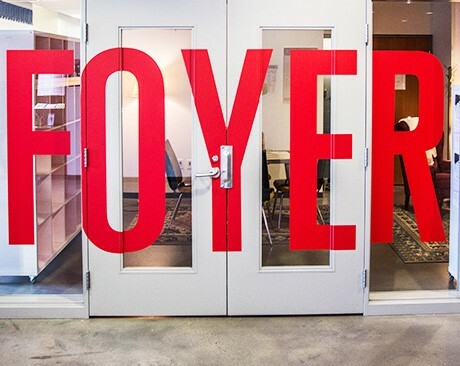 Initiated by the Deans Office in the Faculty of Fine Arts and underwritten by the Office of the Provost and Vice President, Academic Affairs, the idea behind FOYER is to work across graduate platforms in order to incubate new research ideas, while providing graduate students access to facilities normally reserved for those outside their discipline. FOYER will support up to four collaborative research teams in the winter semester 2017. FOYER fellows will receive a small research grant and keys for 24/7 access to the lounge which will serve as their workspace throughout the semester. All terminal degree students (MFA and PhD) are eligible to apply. Research teams must consist of 2-5 members, and represent at least two different faculties. Interested students are encouraged to attend Meet & Greet sessions that take place a different day every week throughout November 2016. Interested in intersections? Otherwise known as graduate student research speed-dating, the FOYER Meet & Greet sessions provide the opportunity to meet up with your counterparts from other faculties and see how your research interests mesh. Information sessions for MFA and PhD students take place in the FOYER space (EV-2.781) in the Engineering, Computer Science and Visual Arts Integrated Complex (1515 Ste-Catherine St. W.), Sir George Williams Campus. Micro machinery, textile antennas: oh my!